Ji-woo has dreams of inheriting her grandfather’s company. However, her grandfather has other plans and they involve a certain person named Kang Min-woo. Ji-woo will stop at nothing to prevent those plans from happening! Could you upload ch 9-24 please~~?? wats the password to download this? how to convert rar files? i cant open the files. where can i get the translation? Really love this manga! I laugh a lot looking the raws 6~25. I couldn't understand a word lol, but I'm sure I'll love it when I read the translation! Thank you very much, wonderful job! Hope to read more of this manga soon! thank you so much for translating this manhwa... I really enjoy reading it... I can't wait for the next chapter...keep up the good work guyz...XD... Thanks!!! Can you please upload the rest? Thank you!!! Thank you so much!! 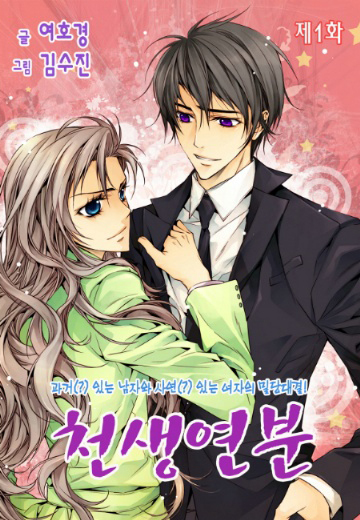 I really love this manhwa......^^Could you please upload the rest of the chapters? THANKS!! Do you have the raws for 26+ to upload? I can open it. It works fine for me. Are talking about how to extract the files from the zip/rar file? If it's about that, you need a software called 7zip or winrar to extract the files in order to see them. If it's not that, then maybe it's the program you are using to view the pictures. I've uploaded the raws from chapter 26 - 46 here. Thank you very much!!! I'm waiting for this. :D THANK YOUUU~! I bet you it's the grandpa at the door. Hi haeyinshin ^^ Thank you so so much for uploading the rest of chapters ^__^ .We really wanted them so much^^ thank you . The only ones I have are 1-10. =/ I've added them to the folder where the rest of them are. I've edited the black bars off of chapters 26-31, and will continue to do so for the rest of the chapters. But It seems that there is a problem with a link. Can you upload it again, please? Thank you for uploading more raws. You have no idea how this made me happy!!!!!!!!! Thank you so much for picking up this project. Loving it! Btw, I think this is a monthly manhwa. Mine are screenshots of ebooks from Ridibooks.com. I apologize, it seems this is a bi-weekly manhwa, not a monthly. I've uploaded Chapter 49 to the usual upload folder. btw, is there any manhwa similiar to cheonsaeng yeonbun too? I love you Haeyisnshin. This manhwa came out on 2012, right? So if you count the chapters it must be weekly like other webtoons. Whatever, thanks anyways. thanks so much Haeyisnshin and love-manhwa for the serie it's wonderful, it makes me happy even though i don't understand a word. merci beaucoup pour vos efforts. is there any update for chapter 50? i wish people would translate it. can someone explain what happened in ch.49?.? The last chapter ended with Minwoo coming back from America expecting Jiwoo but saw Small Kang instead. Turns out Small Kang had come along with Jiwoo (whom he was not pleased to see was cross-dressing again) to the airport. Minwoo was on the verge of getting angry, but understood and even relieved when he found out that Small Kang was there because he had a flight to catch because he decided to study fashion in New York. The ride back between Minwoo and Jiwoo was awkward because they missed the timing, and Jiwoo was dressed as a guy. They go see her grandpa, who basically jumps into talk of marriage, and great-grandkids. Ends with Minwoo asking if they can meet, just the two of them. I was taken aback by this last chapter. Thank you so much, haeyinshin! haeyinshin! can u help me? why can't i download from ridibooks i buy some raws but i don't know how to download the file,from my computer help!! I believe that until recently, the download was viewable from the ridibook app for handheld devices (like ipads and smartphones) but now there's a 'mac viewer' and a 'PC viewer'. However, I believe not all manhwa are available on computers. Haeyinshin thanks for all the chapters until the end. Maybe now you could give us some Tiara chapters if you don't mind ^_^. The Tiara raws are complete right? o.o"
It is still ongoing. Up to 110 chap, max. Does anyone know anything about the extra chapter? Is it unrelated to the main story? My bad, forgot to look the extra epilogue up. Here it is though! thanks for the manhwa, though I do not understand Korean, I will attempt to see myself .... again thanks. Possible to put them in batch files so it's easier and faster to download? Thanks. If you're referring to the mediafire download, there's a green button located near the top right hand corner, which allows you to download the folder in its entirety. But the folder is missing chapters 11-25, so you'll have to download those separately. Thanks for sharing but where can i find chapters 9-16? there's a problem in the link. anyone know where i can find the summaries or the translation? the epilogue it's so funny! and i agree with lydia, their children are cute! can someone help i cant download the ch. 25-50 everytime i click on he green bar it pop out that i need to upgrade to mediapro account. when i cancel nothing happens.. PLEASE HELP!!! 2 haeyinshin: can u please give me link for download chap 49, 50, n extra? I've reloaded chapters 40-51, let me know if any other links aren't working. i love this manga, i read it in mangareader, but not finish yet, im looking forward for the completed series there, thank you and more power..
yeah..me too i cant find the file from 25 to 50, please fix it..
http://www.mediafire.com/?4jh7blqdcf6h5 is the download link for chapters 26-51.